Japan's new polymer battery is thinner than a sheet of paper. We've already seen screens based on various polymers that look set to alter the future of displays, so perhaps the latest polymer battery will be a perfect match for those devices. Japanese researchers at Tokyo's Waseda University have created a plastic polymer-based battery that not only charges in just one minute but which also happens to measure just 200 nanometres in thickness. As we've already suggested, batteries like these - once commercialised and coaxed to hold sufficient charge - are likely to end up in devices that are themselves flexible. 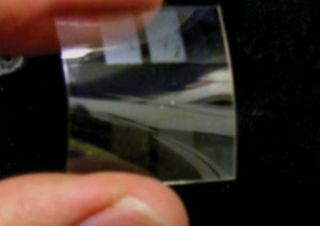 On top of that, future such polymer batteries should be environmentally friendly, may be produced by inkjet printers and will have a durability exceeding 1,000 charge-discharge cycles. If you're interested in the details, the new battery, "has an electrode made from a redox-active organic polymer film about 200 nanometres thick [and] nitroxide radical groups act as charge carriers". Of course, should that need expanding upon then feel free to check out the full paper in The Royal Society of Chemistry's journal Chemical Communications.